A former country of southeast Europe bordering on the Adriatic Sea, Italy, Austria, Hungary, Romania, Bulgaria, Greece and Albania. It was formed in 1918 as the Kingdom of Serbs, Croats, and Slovenes after the collapse of the Austro-Hungarian Empire and was renamed Yugoslavia in 1929. Under the leadership of Marshal Tito, the country became a Communist-led regime after World War II. After Tito's death in 1980, economic problems and ethnic tensions grew. Communist party control ended in 1990, and four of the six constituent republics (Slovenia, Croatia, Bosnia and Herzegovina, and Macedonia) declared independence in 1991. Serbia and Montenegro, the remaining states, abandoned the name Yugoslavia in 2003 and dissolved the federation entirely in 2006. 1918 The Kingdom of the Serbs, Croats, and Slovenes is formed. Croatia, Slovenia, and Bosnia and Herzegovina had been part of the fallen Austro-Hungarian empire; Serbia and Montenegro existed as an independent state (Macedonia was then part of Serbia). 1929 The monarchy's name is changed to Yugoslavia. 1945 After World War II, the monarchy becomes a communist republic under Prime Minister Tito, now called the Federal People's Republic of Yugoslavia. It was composed of six republics: Serbia, Croatia, Bosnia and Herzegovina, Macedonia, Slovenia, and Montenegro, as well as two provinces, Kosovo and Vojvodina. 1980 Tito's tight rein on Yugoslavia keeps ethnic tensions in check until his death. 1991 Slovenia and Croatia each declare independence. As Croatia moves towards independence, it evicts most of its Serbian population. 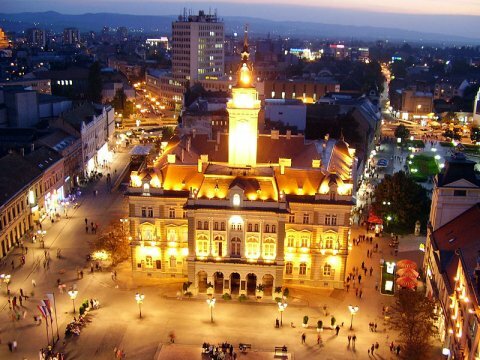 Bosnia and Herzegovina declares independence. Ethnic tensions strain to the breaking point, and Bosnia erupts into war. Thousands die and more than a million are displaced. Serbia and Montenegro form the Federal Republic of Yugoslavia, with Slobodan Milosevic as its leader. 1995 Bosnia, Serbia, and Croatia sign the Dayton Peace Accord to end the war in Bosnia. 1996 In the southern Yugoslavian province of Kosovo, the militant Kosovo Liberation Army (KLA) begins attacking Serbian policeman. 1998 Milosevic sends troops to Kosovo to quash unrest in the province. A guerrilla war breaks out. 1999 After peace talks fail, NATO carries through on its threat to launch airstrikes on Serbian targets. 2000 In the face of trade sanctions from the U.S. and other nations, the Serbian economy continues to deteriorate and dissent spreads. Montenegro discusses separating from Serbia. 2002 Slobodan Milosevic begins his trial at the UN International Criminal Tribunal on charges of war crimes. 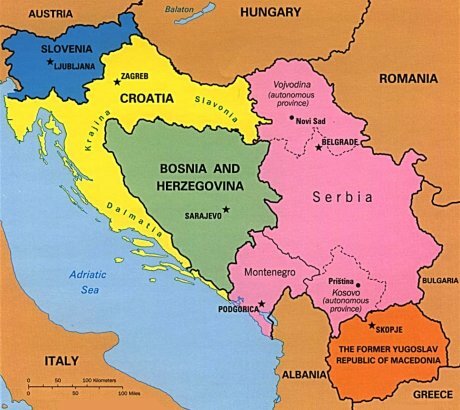 2003 The nation agrees to form a new state, replacing Yugoslavia with a loose federation called Serbia and Montenegro. 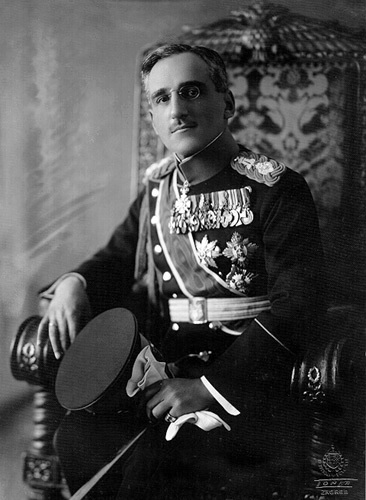 The prime minister of Serbia Zoran Djindjic is assassinated. 2006 Montenegro held a referendum on independence, which narrowly passed. The federal president of Serbia and Montenegro, Svetozar Marovic, announced the dissolution of his office, and the following day Serbia acknowledged the end of the union. The EU and the United States recognize Montenegro and it became the 192nd member of the UN.